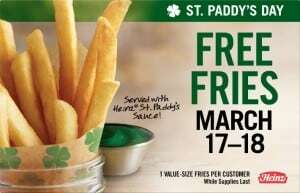 Burger King restaurants are giving out FREE fries with optional green sauce in honor of St. Patrick's Day! No purchase or coupon is necessary. Just show up on March 17th or March 18th and ask for your freebie! Feel free to bring the Burger King press release with you to make sure the stores know about the promotion.